Tottenham maintained their 100% start to the Barclays Premier League season after West Ham gifted them Jermain Defoe's equaliser and Aaron Lennon's winner at Upton Park in a 2-1 win. The Hammers were leading through Carlton Cole's spectacular volley but the England striker's backpass then set up Defoe to level against his former club. Another mistake led to Lennon's winner, with Jonathan Spector slipping at the vital moment and the winger taking full advantage to rifle into the bottom corner. Since leaving West Ham, Spurs boss Harry Redknapp has an impressive record of getting results at Upton Park - but he does not usually need help from his former club. Redknapp has played down suggestions of challenging for the top four but they now have three wins from three and the initial signs pointed to a more comfortable win against Gianfranco Zola's men after defeating Liverpool and Hull. Spurs enjoyed the majority of possession and looked dangerous going forward, with Hammers goalkeeper Robert Green kept busy in the early stages when Tom Huddlestone launched a fearsome drive towards the near post. Luka Modric forced Green into a save at the near post and went wide, with the Croatia playmaker also setting up the chance that saw Ledley King hit the crossbar on the half-hour mark. Luis Jimenez was booked for a foul on Benoit Assou-Ekotto in the build-up, with Modric whipping over the free-kick and King's looping header bouncing off the woodwork. Sebastien Bassong also went wide from another Modric free-kick - but it was not entirely one-way traffic and West Ham had the clearer chances in the first half even if they had less of the ball. Zola is desperate to buy another striker before the transfer window closes but a shortage in attack is bringing the best out of Cole going forward - even if he was guilty of a blunder for the equaliser. He volleyed over early on after chasing down a long pass and juggling the ball like he did when playing for England against Holland. When Spector threaded a ball through and Jimenez intelligently dummied, Cole ran through and saw Carlo Cudicini block his finish. Cudicini had already been called into action when Scott Parker latched onto a poor clearance and struck a 35-yard volley that had the Italian stopper scrambling across his goalline to save. The Hammers had two huge changes just before the break. King bravely blocked from Jack Collison's shot after Cole held the ball up and pulled it back for the Wales midfielder. Then Junior Stanislas was sent down the left with a 60-yard pass from James Collins and the youngster carried the ball into the area - but his dangerous cross was just too far in front of Cole. Cole broke the deadlock four minutes into the second half with his unstoppable volley. Despite his height, Jimenez managed to get his head on the ball, cushioning it back to Cole 25 yards out. The 25-year-old took a touch before swinging with left and sending his effort crashing past Cudicini. 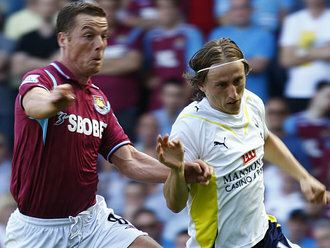 But the Hammers striker went from hero to villain in the space of five minutes. There was no danger when held the ball up near the halfway line but his pass backwards turned into a perfect through-ball for Defoe. The former Hammers striker accepted the invitation and lashed past Green for his sixth goal in four games this season for club and country. Modric almost gave Spurs the lead shortly after but headed just wide when Lennon found him at the far post, while the hosts felt they should have had a penalty when Assou-Ekotto hauled down Jimenez. Defoe, in turn, thought he should have had a spot-kick when Julien Faubert challenged him - but Mark Clattenburg waved play on again. Cole, looking to atone for his mistake, cut inside and went just wide with his shot. Lennon's winning goal came with 11 minutes remaining. Spector lost his footing when there was little danger apparent, with Lennon nipping in and unleashing a drive into the far corner. West Ham Green, Faubert, Collins, Upson, Spector, Noble,Parker (Hines 85), Collison (Nouble 89), Jimenez (Kovac 78),Cole, Stanislas. Subs Not Used: Kurucz, Gabbidon, Tomkins, Payne. Tottenham Cudicini, Corluka, Bassong, King, Assou-Ekotto,Lennon, Huddlestone, Palacios, Modric (O'Hara 86),Keane (Crouch 81), Defoe (Naughton 90). Goals: Defoe 54, Lennon 79.